Last time not worn: 1993 but number was in circulation nearly every season post-WWII until 2010. Now things are really starting to get fun, and this Spring just feels different in a number of ways. The Cardinals appears much more relaxed from the outside looking in, but of course that also could be the calm before the storm. One of the greatest eras of the storied St. Louis franchise has a single leader to thank for much of the group’s formation. Dorrel Norman Elvert Herzog made it to majors as a player but much more interesting to me was finding out he played for the Joplin Miners in 1951, missing Mickey Mantle by one season. Baseball is returning to Joplin this summer so really hoping they bring back some royalty to celebrate. But I’m aware you didn’t stop by to read about Whitey as a player or even for any of his trio of gigs in the American League. He traveled down I-70 to the Arch in 1980 and #24 will forever be part of the family after his decade of dominance. The main reason I wanted to start this project in the first place was growing up with Whiteyball and how easily you can get hooked by the boys of summer. To put it mildly, the Birds on the Bat were in desperate need of a new voice after a rough patch that had lasted since the late 1960’s. Whitey filled both the manager and GM roles during the strike-shortened 1981 campaign and had everything in place for the magical run of ’82. He was too busy giving the green light on the base paths to worry about personnel decisions and handed back over the GM cap after the season started. Six starters from that squad had double-digit steals, and that would be a sign of things to come. 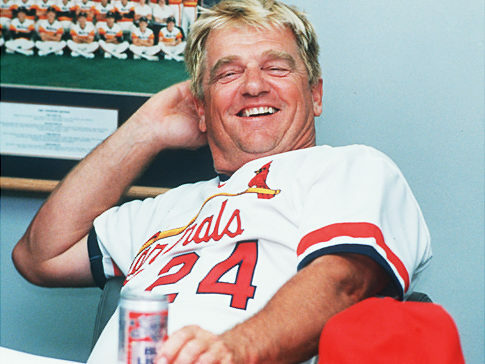 Getting the Cardinals back in the playoffs, Whitey authored up a storybook finish with the World Series victory signalling a changing of the National League guard. The Redbirds kept running all the way into the history books as well as two more Fall Classics while proving roster construction and speed were the name of the game in St. Louis. With Whitey leading the charge, the 1985 club still ranks right up there with any other team of my lifetime. And given that this is the 30th anniversary of that epic run, it is time to finally take the cover off what this site will be doing on a weekly basis. It has always been a dream of mine to marry two of my favorite passions in history and baseball with a peak behind the curtain. The record books are big on finishes, but how did the team start? Did an injury change the equation halfway thru the season or lead to a breakout performance by an unknown rookie? What move made before the year paid off and which one turned out to be a bust? I’m fascinated by all the moving parts and will be picking one legendary roster to follow from April on through hopefully to the end of October. If things play out like we all hope, there will be two pennant chases worth following here at the Conclave and plenty of Whitey to go around. Congrats to the White Rat for charting the course that has anything other than another October appearance deemed a disappointment!